As the expression goes, “hard work pays off”, and Jackie Harris, owner of Jackie’s Java in Fort Collins, knows a thing or two about hard work. While studying business management full-time at Colorado State University, Jackie cleared out her bank account and bought a coffee roaster from eBay. She spent an entire year perfecting her roast before she finally felt comfortable frequenting farmer’s markets in the area to sell her java. It was at one of these markets where she made a connection with the owner of a local coffee shop and scored her first big sale. Jackie now has over 130 accounts in numerous states and has worked full-time in the coffee roasting business for 11 years. Aside from her tireless devotion to making excellent coffee, Jackie also cares deeply about environmental sustainability. Jackie and her employees work hard to recycle as much waste as possible. 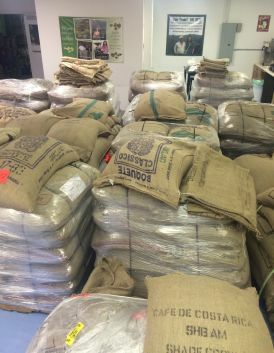 They repurpose their burlap sacks, coffee grounds and chaff to area farmers and gardeners. During the winter, a local crafter turns the burlap sacks into totes and purses. It was Jackie’s dedication to the adoption of sustainable business practices that paved the way to her purchasing a Tesla Model S last March, used both personally and for Jackie’s Java deliveries. When Jackie realized she was putting almost 40,000 delivery miles on her SUV, she felt as though the amount of gas she was using was unnecessary and began looking into electric vehicles. 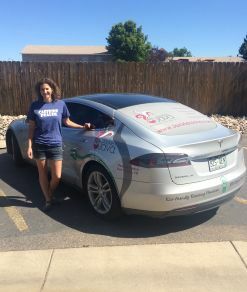 “It was always intriguing to me to have an electric car, and I always wanted to do that.” On a whim, Jackie test-drove the Tesla Model S in Denver and decided that day it was the perfect delivery car for her business. Since the purchase of her Tesla Model S, Jackie couldn’t be happier with her on-the-spot decision. She travels to cities all over Colorado and to Wyoming regularly. Though initially worried about the Model S’ ability to perform in the mountains, Jackie is happy to say the vehicle has greatly surpassed her expectations. She enthusiastically explains the technological ins-and-outs of the Tesla and the minimal-to-zero-maintenance benefit of owning an EV. Jackie hopes to install solar panels in her home someday to reinforce the cost savings and environmental impact of driving electric. 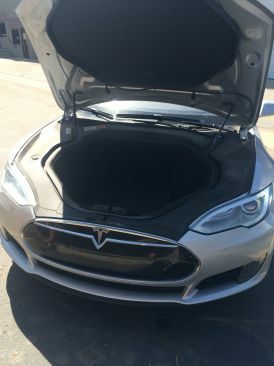 For now, she is using Tesla’s Superchargers located all over Northern Colorado and has experienced no issues with the range of the vehicle. Jackie recalls one experience of heavy snow and ice covering the roads on the way home from one of her deliveries. The highway was closed for hours, and when it was finally reopened, many cars around her were still stuck and could not navigate through the conditions. The Model S easily handled the icy roads and got Jackie out of the storm and back home safely. Jackie’s Java is just one example of the Northern Colorado businesses that are learning about the benefits of driving electric and integrating EVs into their business plan. If you work for or represent a business and are interested in learning how you can get involved, whether to learn about fleet transition like Jackie’s Java or one of many other ways to engage, visit the DENC website, then click on “Programs,” or reach out to Annie Freyschlag with Drive Electric Northern Colorado at afreyschlag@electrificationcoalition.org or (970) 987-3055. To learn more about Jackie’s Java, visit their website at www.jackiesjava.com.